I have been working on the Scarab 22 pop top. The main components were built some time ago and I had to make the sliding hatch, companion way wash boards and the struts to raise the pop top. The sliding hatch and wash boards I built from foam and glass. 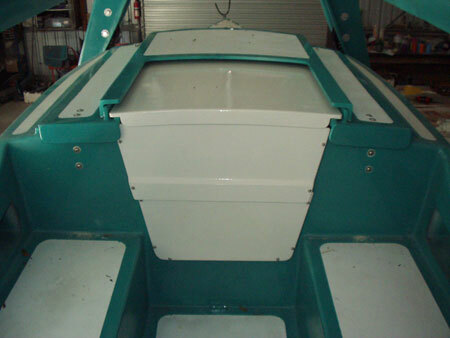 The hatch was curved to the same curvature as the main pop top and the wash boards from some spare off cuts from the Scarab 32. 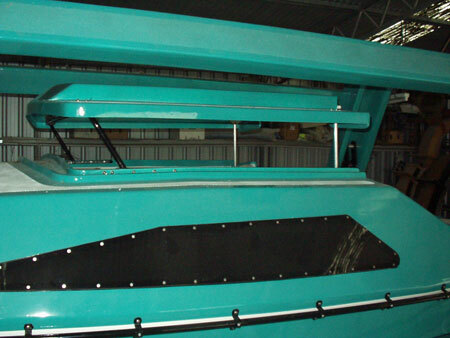 I have made a slight deviation from the details on the plans in that I have incorporated a bent aluminium bow at the front which pivots and provides rigidity (side to side). 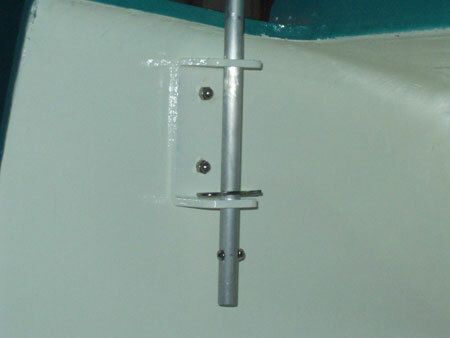 This bow is mounted on slides and sail track fixed to the side of the cabin top. At the aft end of the pop top I have mounted solid 16mm aluminium rods that slide vertically in brackets mounted to the aft cabin bulkhead, these rods are held in the extended position with 'R' clips which bear on the brackets. Fitting the centreboard and assembling the rudder bits is the next job. Not much has happened on the Scarab 32 lately, my time has been taken up with regular trips to Sydney dealing with family issues and working on the Scarab 22. 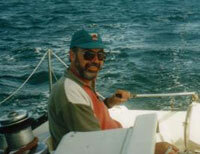 I am getting the Scarab 22 ready to sell to finance the 32 and to provide space in the shed to build the main hull. Yesterday Fran and I attached the starboard float beam assembly to the main hull of the 22, the port side was completed the week before. 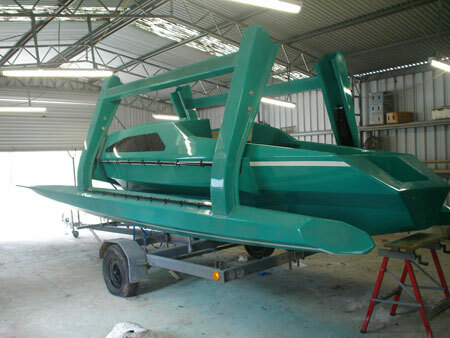 We purchased another portable engine hoist to assist us two oldies lifting and manoeuvring the float/beam assembly which made a great difference, we have at least another two folding trimarans to assemble including the 32 so we thought it would be money well spent. 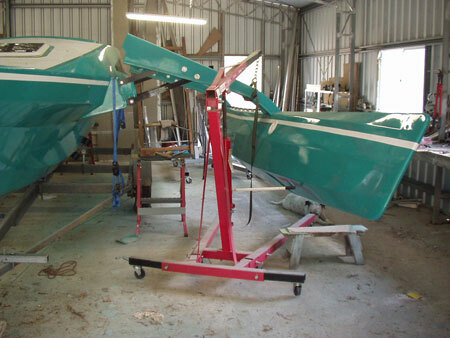 If you are just building one boat and are short of man power, it would be beneficial to hire one or two hoists for a weekend. We got ours from Supacheap Auto on special. I have been considering using a new paint application system for the next boat after seeing the rolling and tipping results of International and Altex at the recent Sydney boat show. It seems to me to be a great way to apply an acceptable finish without spraying. Our favourite paint, Jotun are also bringing out a product that can be successfully rolled, not available in Australia yet but we will certainly check it out when available next year. 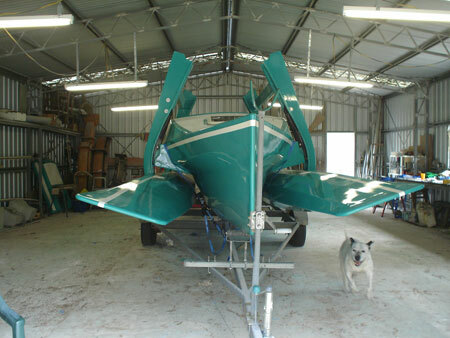 Both Scarab 32 floats have now been finished. The decks are on and taped. The way I made the decks might be of interest to some people. 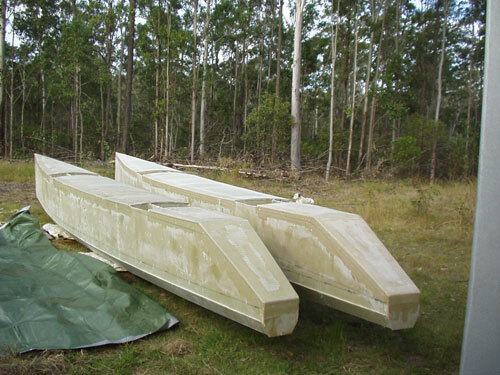 Just came in from the shed after taping in the bulkheads of the second float of the Scarab 32 prototype. Next job is tabbing in the deck beams and then hopefully adding the deck at the end of the week. Things have been progressing at a steady but slow pace on the new Scarab 32 foot trimaran. 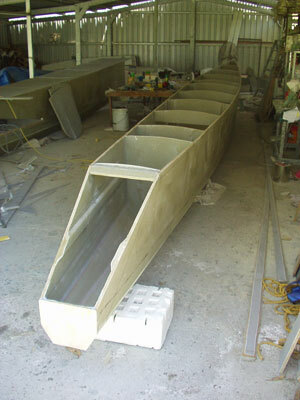 The starboard float hull is complete up to the filling and fairing stage. This will be minimal as the surface just needs a light skim of filler except at the stem. There are a few layers of double bias cloth around the stem which will need to be filled. The port float is about 80% complete. 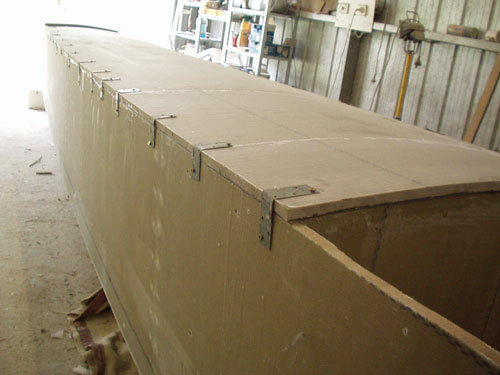 Fran has been very busy building the beams (3 complete) and full length foam sandwich panels for the main hull. When each full length panel is complete we trace the outline of the individual hull panels and cut them out. I have made plywood templates of the panels and these are set-up on the full length panel with a string line to ensure accuracy. I am also working on providing a set of preliminary study plans for the 32 footer. These will be available together with material list soon and be updated by email until they are completed. The full plan set is still a way off yet.